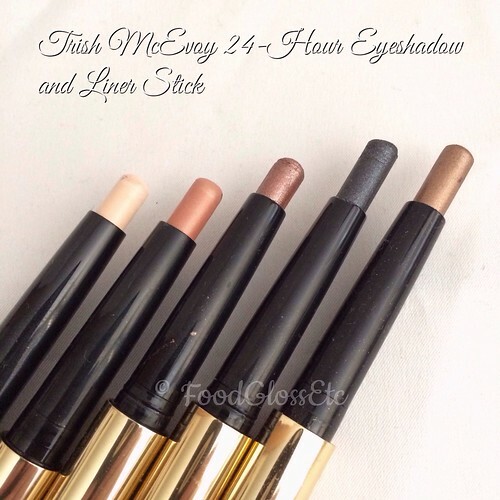 Another great product that comes on a stick is Trish McEvoy’s 24-Hour Eye Shadow and Liner. Oddly enough they are very much like the Laura Mercier Caviar Stick except for the color of the package. Laura Mercier stick body is very dark brown while that of Trish’s is gold all throughout. One nice thing that I totally appreciate about Laura’s Caviar Stick is that there’s a color marker at the bottom end of the stick so that when you’re storing it upside down you have an idea of which color is in which stick. Ingredients: Cyclopentasiloxane, trimethylsiloxysilicate, polyethylene, lauryl lysine, ozokerite, octyldodecanol, synthetic beeswax, synthetic fluorphlogopite, silica, lecithin, tocopherol (vitamin e), ascorbyl palmitate (vitamin c palmitate) citric acid, tin oxide. According to the Trish website, there are 5 shades available. Cream is a shimmering cream. Crystal Gray is a shimmering charcoal gray. Rose Quartz is a shimmering golden rose. Smokey Quartz is a shimmering raisin. And Topaz is a shimmering golden bronze. If you noticed all of them are metallic/shimmery. Swatched on the arm in that size, it looks very disco-ball-y but on the lid it provides just the right dimension, “shimmeriness” is not really an objection especially if over-blended or sheered-out. For more elaborate looks these provide the perfect lid color. 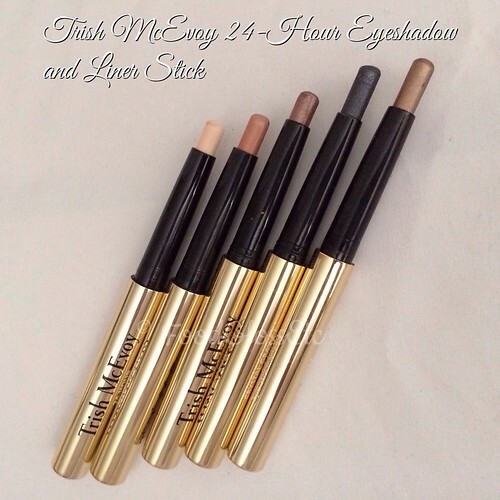 They are more expensive than the Laura Mercier Caviar Stick and comes in only 5 shades. It is housed in a pen making it easy to use and store. Perfect for the purse or for travel. In the span of time I have used it, it has never creased on me. Think NYC summer weather levels and these babies won’t budge while sight-seeing. It says 24-Hour and I can’t tell you if it has lasted that long because honestly, 98% of the time, I will take my makeup off before going to bed. The most I’ve seen it last on my oily lids without fading and/or creasing is 14 hours. The colors are what they say they are. 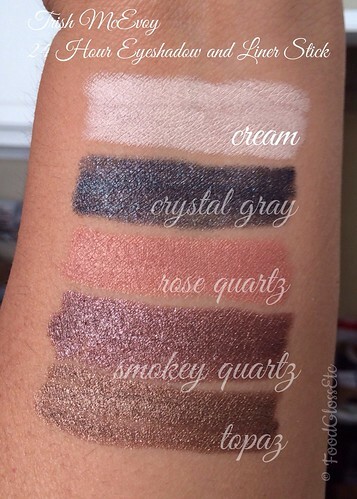 Beautiful high pigmented colors, shades you can use for that easy one product eye look that can take you from day to night. I wish they would come out with matte or at least satin ones. I know, wishful thinking. Options…options…options, right? At $32, this is the most expensive eye color stick I have seen. What do you think? Hey Emilie, oh thanks for the heads-up about this post! Trich Mcevoy is not easily accessible here, but I’ve definitely got my eyes on Topaz and Smoky Quartz! Glad to hear they wear so well on you, too!